Gov. Mitt Romney was my choice for the Republican nomination for President in 2008. So far I have yet to see anyone ready to change that. 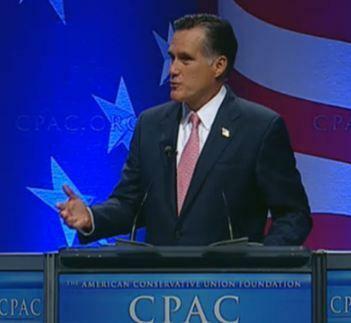 In was was clearly designed to be a Reagan style speech of the greatness of American exceptionalism and the optimistic future of our country, Romney received several standing ovations from the CPAC crowd. Here are some excerpts from his speech. 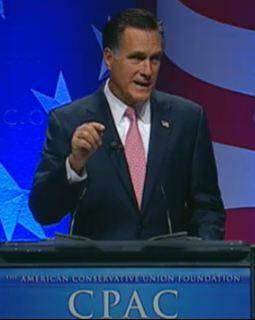 Romney discusses the totally new Barack Obama based on the state of the union speech. Said it was unbelievable change for as soon after he called for more spending. This is not "Brave New World". It is, rather, "Groundhog Day". More of the same. Critized Obama's "They Get, We Give, Diplomacy". If Obama could construct ANY foreign policy, that would be a good change. Economic policy is the worst economic experiment in history. Answer to the unemployed was "it could be worse". President Obama has watched over the largest unemployment rise in US History. There are more people out of work in the US than there are people working in Canada. It will take a new president to put America back to work. 15 million are out of work and millions more can't find the kind of work they want to do. Liberals should be ashamed that their policies have killed the dreams of Americans. Liberal welfare policies have condemned generations of Americans to dependency on government. Liberals seek a European solution to an American problem. It did not work there and it will not work here. The right answer is to believe in American and the Constitution as it was written and intended by the founding fathers. Told the story of his father's climb from a paint salesman to chairman of American Motors and Governor of Michigan. We are an Exceptional Land. The American that you and I believe in as a unique blessing. Our founding fathers redefined Liberty and shared it with the world. I will not, and I will NEVER apologize for America. I don't apoligize for America because I believe in America. We love this land and we believe in America. Believe in America - Our Freedom depends on it! Great speech. No candidate for 2012 is perfect. I think overall he can do the best to help America. Go Mitt!